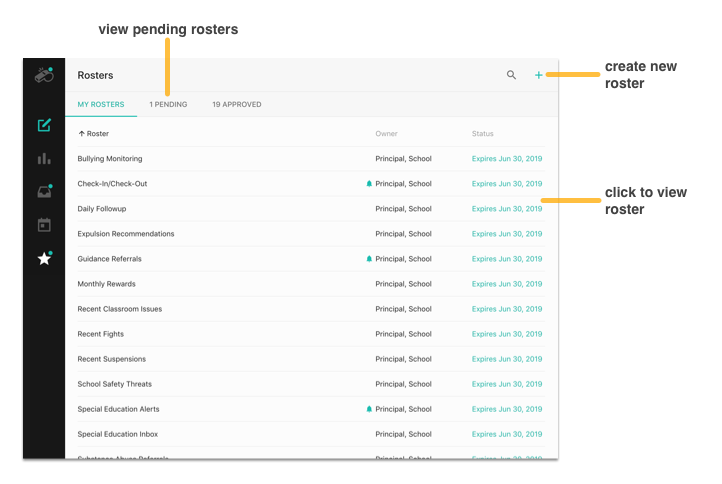 Rosters help you stay on top of incident trends and events for your students. 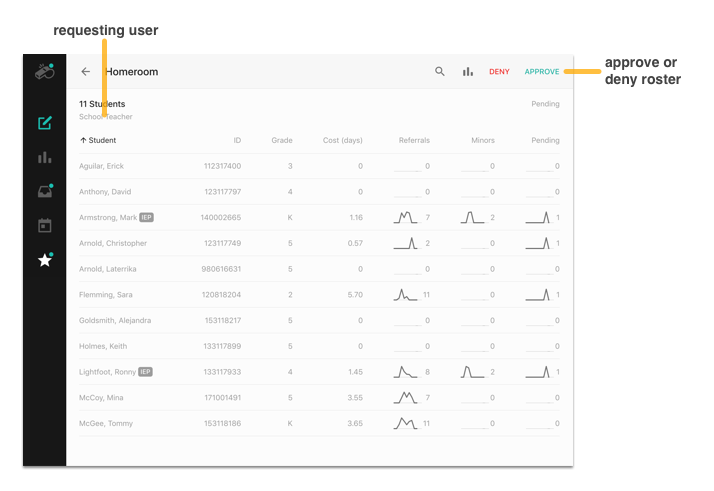 Rosters allow you to receive new incident notifications, access incident data and reports for rostered students, and track group progress with roster-level reports. Roster access may require administrative approval. There are two roster types to choose from. Create a Specific Students roster when you know the individual students you want to include in the roster. This roster type is great for homeroom classes, athletic teams and clubs, and tracking intervention progress for specific students. A Smart Roster is a dynamic list of students that changes in response to demographic and incident data. Create a Smart Roster by composing a simple sentence, such as “All students with 10 or more incidents.” or “Students with an IEP with 8 or more days of suspension.” and students will be automatically added and removed from the roster when incident data changes. To create a roster, click the new roster button in the toolbar, choose a roster type, name the roster, and define the students you want to include on the roster. When your roster is complete, click the Request button in the toolbar. You can optionally enable email notifications when a new incident is reported for a student on the roster receives and/or when actions are assigned to the incident. Once your roster is approved, you can click a student name to access that student’s incident report. In addition, you can tap the notifications button in the toolbar to receive an email when any student on the roster receives a incident from another employee. In addition, consequence data will be added to your Calendar view for any student on an approved roster. Rosters can be edited after they have been approved, but adding a new student to the roster will require re-approval from your administration. In most cases, rosters cannot be accessed until approved by an administrator. New roster requests are shown in the Pending tab and can be approved (in whole or in part) or rejected outright. Approving a roster will grant the requesting teacher access to incident data and reports for students on the roster. Request and access rosters using the Rosters function. Administrators can approve roster requests.